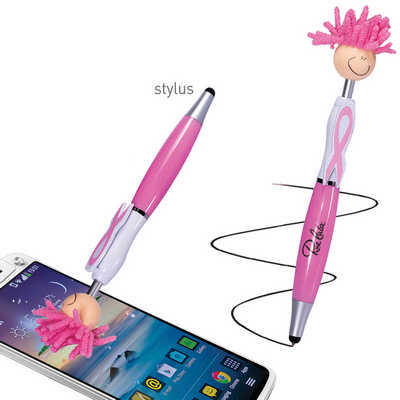 Push button ballpoint pen / stylus with awareness ribbon clip and microfibre hair, suitable for cleaning touch screen surfaces. Fun for all. Distinctive when sitting in pockets. Mop Tops are a fun promotional item that grab attention. Writing distance: 2.1 kilometres. TC roller ball. Nero pigment ink. Colours - Pink Size - 20mmL x 160mmH Decoration Area(s) - Pad Print : Barrel - 50mmL x 7mmH. Price includes : 1 Col 1 Pos Print. Setup is included.